Benefit sanctions, workfare, cuts to disability benefits, cuts to benefits for migrants, cuts to benefits for young people…… To the long list of vicious government attacks on benefits claimants, we must now add ….pyschocoercion. The Tribe of Moles thanks Dr Bruce Scott for his illuminating article on this sinister DWP strategy. Encouragingly he concludes by highlighting the resistance which is underway. As Dr Scott describes, work – or rather employment – is held up as THE life-goal all should aim for, and as an obligation of any responsible citizen. But in capitalism jobs generally only exist if they profit employers or boost state power. The majority of jobs are either socially useless (banking, insurance, finance, etc) or socially harmful (from arms production to car production). The consequent lack of job satisfaction is compounded by the nature of work today – often repetitive, routine, boring and/or stressful, and outside the control of the worker. It needn’t be this way. Work could and should be a satisfying creative activity that meets peoples needs. With workers control, no bosses and no profit motive, work could be recreation and art. People WANT to do something meaningful – Edinburgh Coalition Against Poverty has battled to defend claimants who wished to continue the voluntary work they enjoyed, instead of being forced to instead go on workfare in places like Salvation Army charity shops. The left needs to ditch its veneration of work. We don’t want full employment, we want full enjoyment! From psychocoercion to sanctions, the assaults on social security attack the whole working class. By making life on benefits intolerable, the government aims to frighten workers into accepting the worst of conditions, to avoid falling into the abyss. The battle to defend benefits must not be left to claimants alone. Unemployment as psychopathology to be “cured”: Not in my name! by Dr Bruce Scott, Psychologist, Psychoanalyst, Author. College of Psychoanalysts-UK, Free Psychotherapy Network, Philadelphia Association, London. A strange and ominous wind is blowing through the UK. Notwithstanding the brittle cultural hegemony of “mental health” which directly negates the real psychic suffering of people and largely ignores the economic and political antecedents of such suffering, the people of UK are being duped into accommodating a psycho-economic policy from Westminster and the Department of Work and Pensions (DWP), a policy also accepted by the Scottish government , that dictates work is good “health outcome”. Now OK, work, the right kind of work, being able to work, rewarding work, and non-alienating work can be a good thing; however, work per se is not good if it is under conditions of poor pay, zero hours contracts, in conditions where human flourishing cannot occur, and where workers are being exploited for capitalists’ gain; this is harsh reality of austerity fuelled Tory Britain today; a reality where unemployment is now deemed to be the remit of “mental health” services and psychological treatment. This is called psychocoercion. “The joining of Government Health and Work Departments is not helpful, and current DWP policy intended to reduce the socio-economic causes of mental illness to the one simple fact of unemployment is clinically and intellectually ridiculous. The resulting policy promoting work as cure, which your organisations are now supporting, is offensive and dangerous. It is wrong for therapy organisations to buy into the unthinking praise for ‘work’ that often forms part of the rhetoric of governments”. From the correspondence between Mental Wealth Foundation (MWF) and Big five professional organisations who support the government’s and DWP’s use of psychological therapies. Further quotes in bold come from the same source. For over a decade the UK Government has been using psychological treatments to get people with “mental health” issues back to work. Since 2010, austerity policies of welfare reform; punitive Work Capability Assessments, benefit cuts, workfare, sanctioning have intensified government strategies of psycho-compulsion and work cure for welfare claimants. Improved access to psychological treatments (IAPT) and their therapists are being co-located in Jobcentres, and DWP mental health advisers and employment coaches are being placed in GP surgeries, food banks, schools and libraries. Worryingly, the five biggest national organisations representing the professions of counselling, psychotherapy and clinical psychology have welcomed these policies and the state funding of back-to-work therapy. These groups represent the New Savoy Partnership, an annual shindig and market stall for state therapies in the NHS, vying for top spots in the “mental health” services market. The New Savoy group frequently host conferences opened by keynote speakers from the by DWP and Health ministers to emphasise the close relationship between the professional bodies, mental health charities and Government mental health and work-cure policies and funding. Hundreds of “mental health” workers accredited by the psy professional bodies have been hired by the DWP to provide support into work. These are jobs that are experienced as highly unethical by many of the professionals being directed into this kind of work; unemployment is not a “mental health” issue, and any psychological treatment should be taken out of the context of the DWP where sanctions and punishments for lack of work related existence hangs over the claimants head. The power imbalance in such scenarios, equating one’s “mental health” with getting a job is a dangerous conflation of two issues that place guilt and coercion into the path of a claimant. In March 2016, the Mental Wealth Foundation (MWF) wrote to the Big five professional organisations challenging their support of the government’s and DWP’s use of psychological therapies to put force and pressure people with “mental health” difficulties to get into work. The exchange of letters between the Mental Wealth Foundation and the professional bodies is here. So far, all but one of these organisations are refusing to enter into dialogue with the MWF and continue to argue that they have had private reassurances from the DWP that “work cure” therapy will not be mandatory for benefit claimants, and will not involve setting entry into employment as a therapeutic outcome. However, this assertion contradicts the reality of the DWP’s punitive and coercive working policies and practices of workfare, Work Capability Assessment and sanctioning and its growing determination through its Work and Health initiatives to prioritise work as a good health outcome for “mental health” issues. It also contradicts the job specifications on advertised jobs for therapists working within this context. 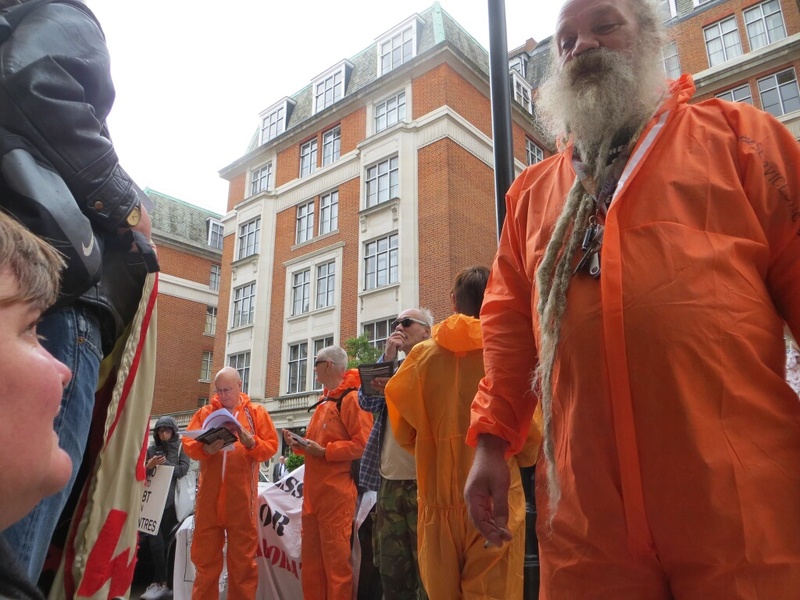 This is why I joined comrades from the MWF and other organisations and individuals on the 5th July in Hallam Street, London, outside the Hallam Conference Centre where the New Savoy group and members of the big five psy organisations were meeting. We called on them (from outside) and from within the conference room (some were invited in to the conference speak directly to the delegates) to refuse collaboration with the DWP and the unethical provision of psychological treatments by its members. We also called on them to stop the unethical conflation of unemployment with individuals’“psychopathologies” needing to be “cured” to make them fit work. This detracts from peoples real issues of mental distress, and detracts from the political and economic issues of why people become and are distressed. All across the UK, including Scotland, the ill-wind of DWP psychocoercion is getting into the gaps of peoples experience and becoming a dangerous cultural (state) hegemony that must be resisted. It is a dangerous oppression and a suppression of the angst that needs to be expressed in response to imposed austerity from neoliberal capitalist agendas. In response to psychocoercion and where “service users” and psy professionals are being corralled into the service of neoliberal and austerity politics, we collectively called: NOT IN OUR NAME! i) The author is highly critical of the nature, conceptually and scientifically of ‘mental health’ or ‘mental illness’ from a biological or psychological perspective. The biochemical/organic theories of ‘mental health’ are simplistic, reductionist, and scientifically weak and highly dubious. Similarly, the cognitive revolution which encompasses the rise of cognitive behavioural therapy is also scientifically lacking and conceptually (from a philosophical perspective) flawed. The author prefers the term mental distress. Boyle, M. (2002). Schizophrenia: A scientific delusion? 2nd Edition, Oxford: Routledge. Healy, D. (2003). Lines of evidence on the risks of suicide with selective serotonin reuptake inhibitors. Psychotherapy and Psychosomatics, 72, 71-79. Laurent, E. (2014). Lost in cognition: Psychoanalysis and the cognitive sciences, A.R. Price (Trans.) London: Karnac. Moncrieff, J. (2003). A comparison of antidepressant trials using active and inert placebos, International Journal of Medicine, 12, 117-127. Wheeler, M. (2006). Reconstructing the cognitive world: The next step, London: MIT Press. ii) The author wrote to the Scottish government earlier this year and asked what its position was on psychological therapies being deployed via the DWP policy of psychoceoercian. One quote from the letter in response from the Scottish government summed up their position. “However, the Scottish Government recognises that work is an important part of people’s lives and can help to enhance health, wellbeing and quality of life, and people should have the opportunity of support to return to and remain in work. You may be aware that from April 2017, DWP’s Work Programme and Work Choice will be replaced by Scottish services for support, work experience and training to help people find work and stay in work. With the development of these new employment services we aim to provide targeted support to help long-term unemployed people enter sustained employment.” – Quote from letter from Scottish Government to Dr Bruce Scott -30/06/16. iii) British Association for Behavioural and Cognitive Psychotherapies; British Association for Counselling and Psychotherapy; British Psychoanalytic Council; British Psychological Society; United Kingdom Council for Psychotherapy. iv) The Mental Wealth Foundation (MWF) is a broad, inclusive coalition of professional, grassroots, academic and survivor campaigns and movements. They bear collective witness and support collective action in response to the destructive impact of the new paradigm in health, social care, welfare and employment. They oppose the individualisation and medicalisation of the social, political and material causes of hardship and distress, which are increasing as a result of austerity cuts to services and welfare and the unjust shift of responsibility onto people on low incomes and welfare benefits. A recent MWF conference focused on Welfare Reforms and Mental Health, Resisting the Impact of Sanctions, Assessments and Psychological Coercion. Currently, seventeen organisations are gathered under the MWF umbrella: Mental Health Resistance Network; Disabled People Against Cuts; Recovery in the Bin; Boycott Workfare; The Survivors Trust; Alliance for Counselling and Psychotherapy; College of Psychoanalysts; Psychotherapists and Counsellors for Social Responsibility; Psychologists Against Austerity; Free Psychotherapy Network; Psychotherapists and Counsellors Union; Critical Mental Health Nurses’ Network; Social Work Action Network (Mental Health Charter); National Unemployed Workers Combine; Merseyside County Association of Trades Union Councils; Scottish Unemployed Workers’ Network; National Health Action Party. "The left needs to ditch its veneration of work. We don’t want full employment, we want full enjoyment! "